Good news for Thunderbolt residents! When you lease a new storage unit from Victory Drive Self Storage, we offer you the convenience of a free truck rental at move-in. Our facility is monitored by 24-hour digital surveillance. Wide driveways and self storage units with roll-up doors serve to make storage easier for you. Large dollies and carts are also available to aid in the move-in process. Free use of our moving truck is available only at the time of initial move-in and for 10'x10' storage units or larger. Please inquire in advance with manager to ensure availability. Truck use may not be deferred until later date without manager’s express written authorization. Truck use may be denied at any time at manager’s sole discretion. Truck use not available with any other special offer. Please inquire about reserving the truck upon initial move-in. 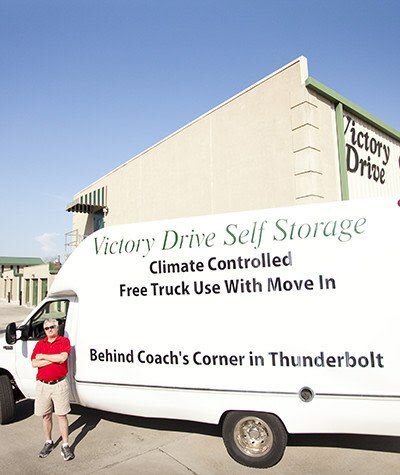 To learn more about the free truck at move-in offered by Victory Drive Self Storage, contact our leasing office. Let our team help you save time and money!